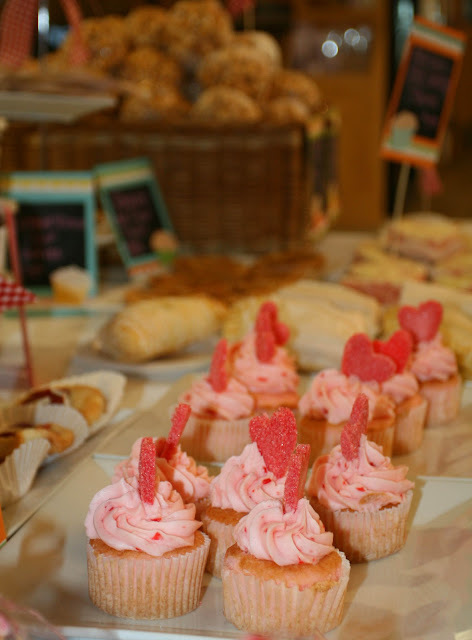 Adventures of a BusyBee: Bake Sale Cuteness! 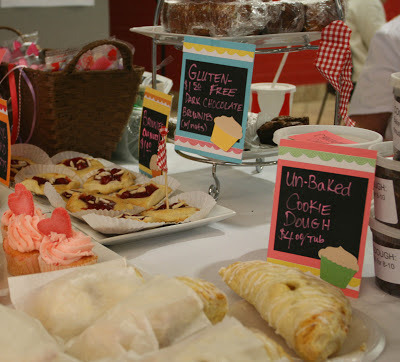 So, I have been coordinating a Bake Sale at the Culinary School I am currently attending. It's a fundraiser for those of us who are competing in a student competition called "Skills USA". I will be representing my school in the "Restaurant Service" category, and there are 6 other students who will be competing in the other categories. This week I ran it all week through Valentines Day so we could take advantage of the holiday opportunity. 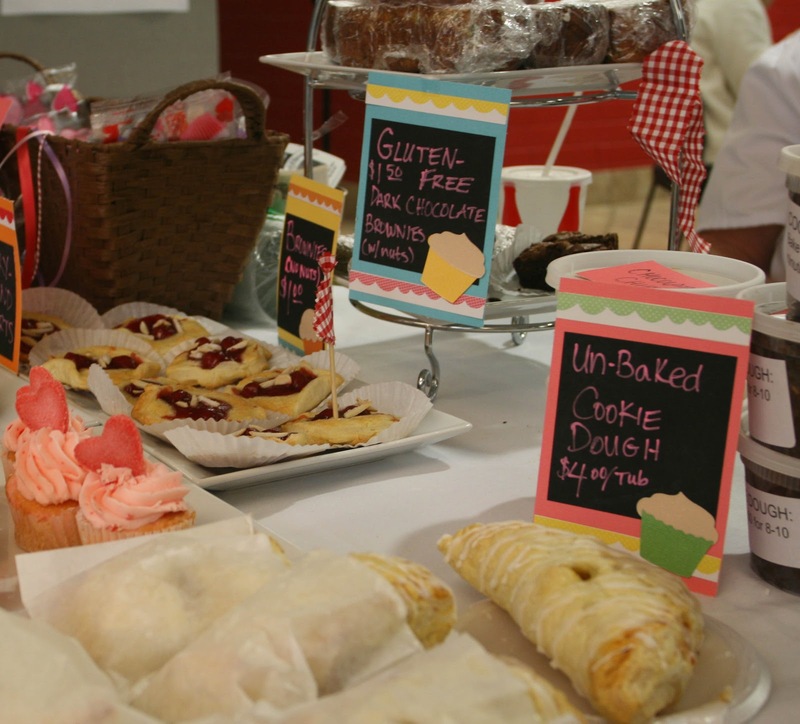 I took it upon myself to make the Bake Sale "CUTE". 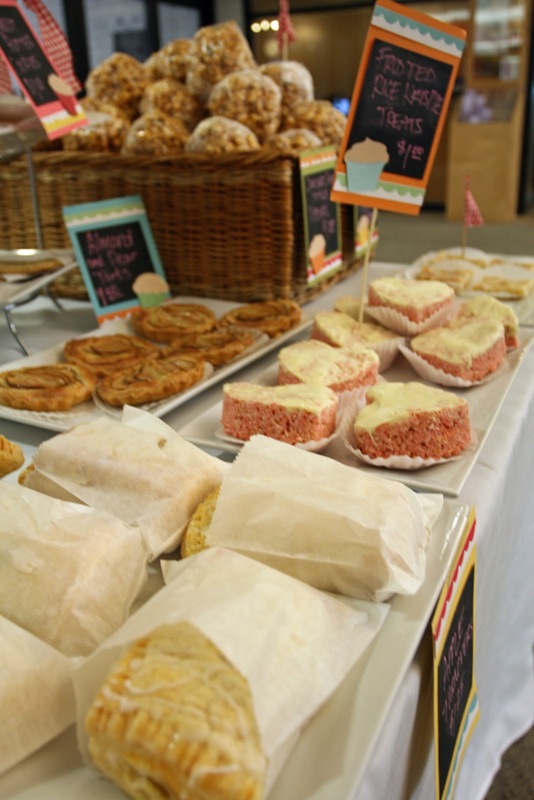 You can't have a Bake Sale, in my opinion, and have it be boring and nondescript. Merchandising sells, people! So I spent a Sunday afternoon putting together some signs and making other decor to match theme. 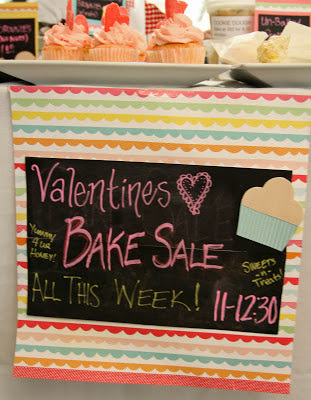 I had found some cute striped paper with different colored scallops on it, which I cut up and used for the sale signs. It didn't take me long to do them, and they were so easy to make that I wanted to share my tips. For the bases, I used Bazill Bling card stock which has a slight sheen to it. The scallops were cut from a 12x12 piece of paper, and I got 3 cuts from each strip. That gave me a lot to work with. 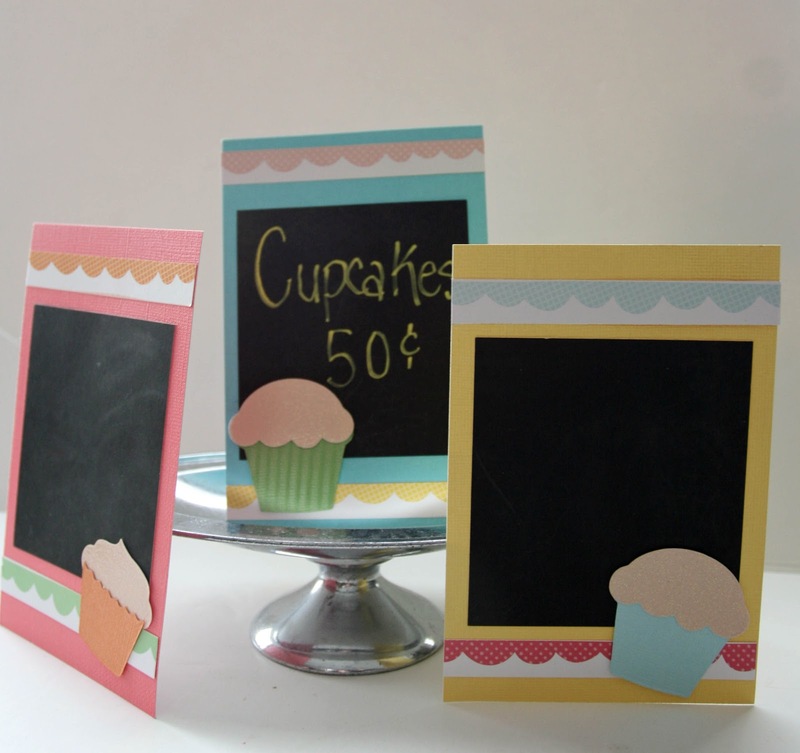 I cut the cupcake liners from the same Bazill paper using a die cut at the scrapbook store. It also included the icing parts, and I cut those from champagne colored glitter paper. I did a zoom on the photo below hoping to show some of that detail. The green liner is one that I actually cut by hand, and sent it through my crimper. That sign was actually my prototype to see how it all turned out. For the chalkboard effect, I simply sprayed black chalkboard paint onto posterboard! I wasn't sure if it was going to give me the effect I wanted, so I only gave it one coat. For something that I want to keep for myself, I would give it another coat. It's not really noticable in such a small size, but there are areas where it wasn't as good of coverage. But hey, for a quickie spray job, it did what I needed it to! I simply cut squares and attached them to the base. The cupcake went on top, and Wa-la!! 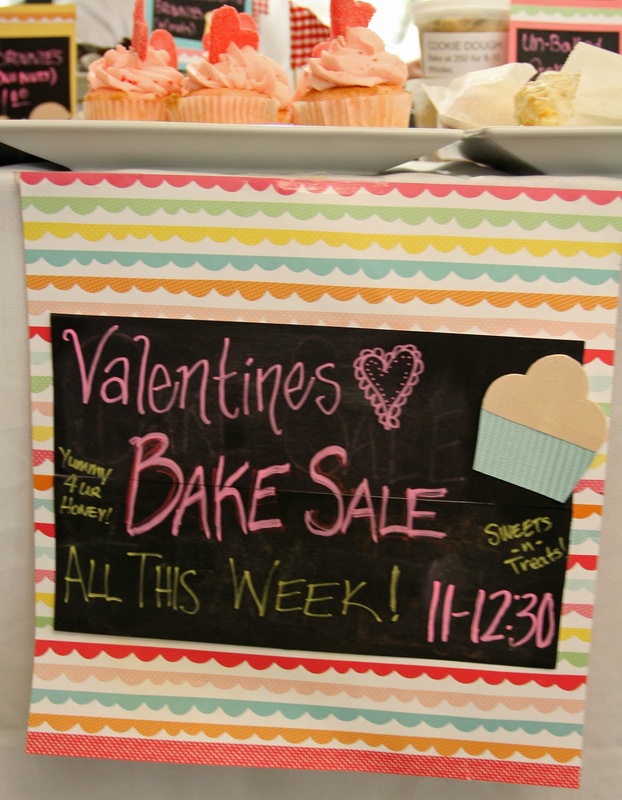 Cute Bake Sale signs! On some of them, I made an easel back from more posterboard, and for others I taped them to a skewer. Most of them I just taped to the front of the serving trays on the table. I used Chalkboard Markers that I got on Amazon, but just this past week I discovered that Colored Pencils work as well! Of course, chalk also works, but I wanted COLOR. 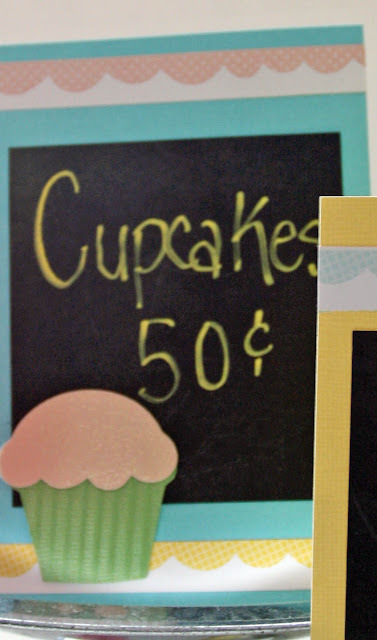 I saved 2 larger pieces of the chalkboard paper to use on the advertising sign, and attached that to a full size piece of the scalloped paper. I freehand cut the liner for the larger cupcakes, and I used the top two-thirds of a Beehive die-cut for the frosting. Just a note: Chalkboard markers have to be wiped off with a damp towel. I also had a pennant banner overhead made of red gingham pennants cut with pinking sheers, and then glued onto blue bakers twine. Of course, I forgot to take a picture of that! 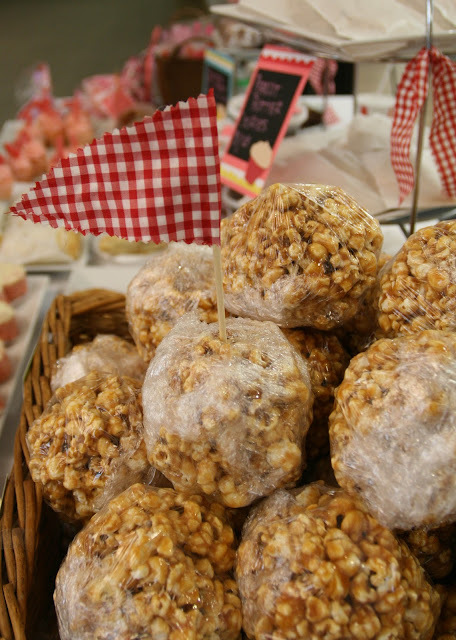 However, I also made little flags on sticks to poke into some of the treats for extra flair. Additionally, I had cut strips of the same fabric that I tied onto the plate racks. One last shot. 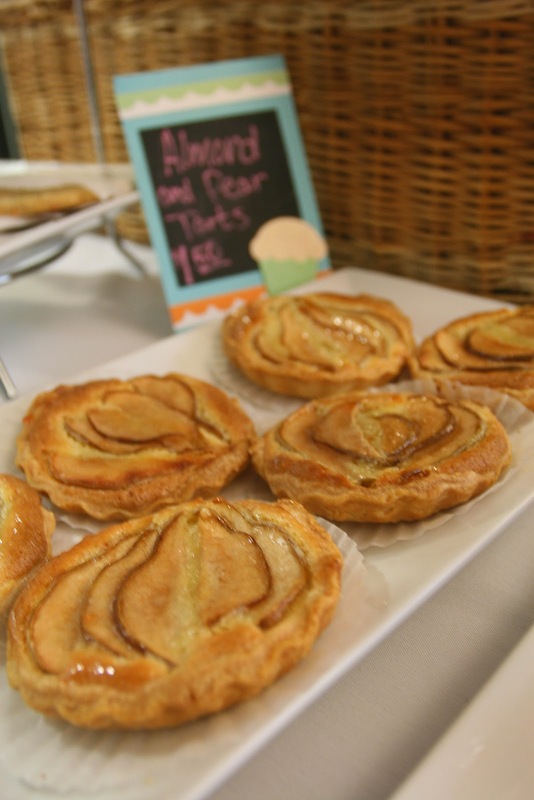 The Almond Pear Tarts are my own creation, and they are simply divine! I give the recipe for them on my food blog here so you can make them for yourself. 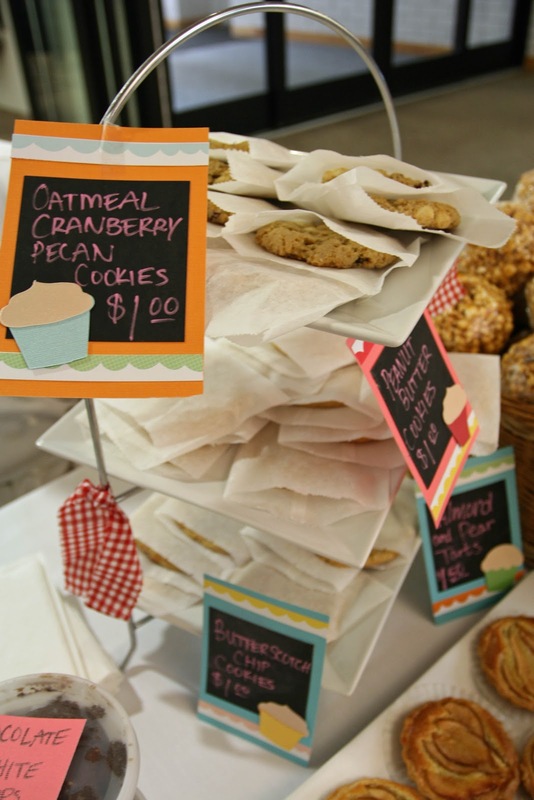 I created the recipe after I had a similar item at a local gourmet bakery in Salt Lake City and fell in love. I had leftover dough and filling, so we also made some loose-formed tarts with cherry filling instead of the pears. They were just as yummy....just not as pretty!